After the fiasco on September 29th and discovering that inland of the island seems a bit kinder, I planned accordingly. The evening of September 29th, I looked over my collection of maps to get a rough idea of where I might start from and a general direction of travel for the following morning. I found a cycle path running off through the country side, away from roads starting at a little village called Rø. Much of it was quite straight with only a few gentle curves toward one end. It very much said, ‘Rail-Trail!’ to me and we love the rail-trails. Gentle grades once developed for trains are our friend. So, Jens dropped us off under gray skies and temperatures of about 54 F. If I’d been paying better attention, I would have had us stop at the church just out of sight around a curve and behind some trees. Unaware it was there, I opted to start at a business dealing with glass in some fashion or another. As I pulled the trike out, I remembered the chain tube still needed dealing with. I asked Jens about the sharp knife he had commented on having since I lacked duck tape. As he rummaged through the roof box, I looked in a small bin in the car. Wouldn’t you know it? There lurked a roll of duck tape, black even. I preferred that as cutting the tube away would have had the chain rubbing on the body and back tire of the trike when folded. Everything wrapped back together (gotta love duck tape! ), trike assembled and we were ready to go. Jens drove off as I did loop around the business’ parking to orient myself. It was a short jaunt to the beginning of the trail. The rides of September 28th and 29th, Loke was amazing. A few laggy moments here and there, perhaps, but most of it he’s been wanting to go and fast, pulling like an exuberant 2 year old husky. He’s been setting paces like a sulky horse too. Sometimes his trotting breaks 9 mph, pushing 10 mph since I won’t let him run. Nor has there been any limping or hopping. And that energy, drive and pulling continued for our September 30th outing. He so much wanted to run down that delightfully flat graveled trail. He tried. He’d push his trotting speed up and then give me a sly glance from the corner of his eye while edging into a lope. I’d call out for him to take it easy and flutter the brakes until he lapsed back into a jog with a sigh. As we rolled along, bumping from gravel to a stretch of tiny paved road beside a golf course, something about the name Rø kept nagging at me. At another barrier for us to navigate where the unpaved cycle path resumed where the road took a sharp curve right, I paused to look at maps. Right there, not far from where the cycle path started was a bright pink circle and a number. I pulled out the map key I’d made. Yep, a church. Instead of sulking about looping back as I had the day before, I laughed. Ppft. It was only going to add about a mile to the ride and all of that on flat ground. Loke looked forlornly back at the green shaded gravel path as I wrestled the trike around. Still, once I clipped in, he was off like a shot and doing his best to run again. Taking a right from where we’d started the trail, I soon spotted the church beyond some trees and up a bit of a hill. I hit the slope and could feel the lingering exhaustion of the previous ride. It burned in the weak-feeling muscles. We made the climb and I scooted across the road to park in a patch of grassy lawn just outside the church yard. I loosed Loke from the trike tether, giving him a bit of movement with the trusty blue cable and walked over to the church with both Jens’ little point-n-click and my Canon. There was a man doing some maintenance work on one of the buildings by the church wall. He gave me a nod as he went about his tasks. Rø Church was rather impressive from the outside. Huge block of a tower standing at the forefront as if protecting the rest of the church. It surprised me, when I came around toward the front, to find the tower wasn’t square like just about every church tower I’ve ever seen. It was rectangular, longer across the front than sides. Of course, that might be true of the other Danish churches I’ve seen. Upon a closer look from photos of my trip to Denmark last year, Danish churches do have rectangular rather than square towers. Maybe this one looked odd for it because the peak was different, lacking the stepped sides and the fact the stone work wasn’t hidden under centuries of thick, white plaster and paint. Since there was someone working around the church, I decided to try the door. It opened easily. The interior of the church was pretty, in a stark, simple fashion. No murals, very little color other than white. The pulpit hung from the wall like those in Sweden, lower lower down and lacking much in the way or ornamentation. There was a pipe organ, but even it looked humble. A large wooden box with a few pegs and levers set above the keyboard and the pipes standing above. Functional is probably the most apt description of for it. Quite a shock for one who is used to such organs being fantastic works of art as much as musical instrument. And how on earth did I manage to not take a single photo of the church interior? I thought for sure I’d used Jens’ PnC camera in there, but nope. Not a single shot of the inside. Well, poo. Photos done, we were off back to the cycle trail. Further down the trail & so much nicer. Loke tried even harder to run this time. I guess he wanted to reach new ground he’d not already seen twice in less than half an hour. This time we passed a young woman walking a young German Shepherd. The dog yapped and danced at the end of his leash. He wanted to race with us. Hehe. It was so very nice to move. After a mile or so beyond where we’d turned around, we arrived at an intersection. To right another unpaved cycle path ran on, a sign saying Olsker was 7.8 km away, a bit less than 5 miles for the non-metric types. Tempting in spite of the fact the gravel looked loose and after the first 50 yards or so, it went right up a steep slope. I knew Olsker was a round church and I wanted to see at least ONE of those before I left the island. Preferably all four. I wriggled us through the barrier (why on earth was one there?!) and tackled it. Loke threw himself into the harness as we hit the slope. My legs screamed as I struggled up the climb. In spite of the furry powerhouse, the tire slipped a bit as I struggled for every foot of the climb. At the top, it leveled off and the earth packed down some. But about 20 yards on, the trail did a hairpin to climb another steep grade. I washed my hands of it. My legs weren’t going to put up with much more of such slopes and I wanted miles per hour, not meters. At least getting back down was easy even if it meant wrestling through the barrier again. I stared longing back a few times as we pushed on. It began to drizzle as we went. Not really enough to get me truly damp. It was enough to make me reluctant to pull out my camera for photos. I started relying heavily on Jens’ point-n-click that he’d let me bring for church interiors or any where I could get far enough back to use the new Canon lens. Thankfully his camera is not only impact resistant, but also water resistant. A little rain wasn’t going to hurt it though droplets on the lens were annoying. I really was in a good mood during the ride. In spite of drizzling gray sky, I smiled. We were making good time. Loke was every inch a strong, healthy husky with sound joints who in no way showed his 9+ years. I was riding through another landscape in a country other than my adopted home. On the flat trail, my legs felt fine. What was there not to smile about? As for the ‘making good time’, compared to the previous day, we were flying. In the first 25 minutes of the ride, we’d covered over half of September 29th’s total miles and that’s with whatever time it had taken me to tether Loke, give him water, walk around Rø Church to look for the runestone as well as peek in side. An hour into the ride, we’d done over a mile more than the 4.6 miles that had taken us almost 3 hours. Yeah, I was smiling. It was wonderful to feel like I was getting somewhere rather than simply spinning my tires… figuratively and literally. Too soon, the rail trail ended. Squeezing out through a barrier I could roll through, we came out in the parking area of some kind of light industrial building. By then, it was raining. Not a torrential downpour, but I was definitely getting wet and Loke trotted along with a distinct expression of distaste. He can be so much like a cat at times. Emerging from the mini-industrial park, the village’s church stood high on a hill… of course. Klemens Church looked a lot like Rø Church. Rough mortared gray stone, imposing and even a bit bigger. Sadly, there was no lush lawn to park the trike with Loke. Still I set him up with some water and made the final climb up through the church yard. Up near the back of the church were a few runestones. One was rather impressive one, over 6 feet tall with a continuous ribbon of runes around two sides. Another was unusually displayed. Broken in 3 pieces, they had been put into a wooden frame where cement had been poured around them. Once it set, they raised the frame vertically and put it near the church. Clever. A little sign showed a few more somewhere outside the church yard wall. I went looking. Of the three, I found only two and lucky to have spotted them. They were hiding in the wall, very weathered. Surprising I made them out as I didn’t think I had the eye to spot such things without the help of paint and flashing neon outlines to scream, ‘here I am!’. That last stone eluded me in spite of a careful search of anything remotely rock like for a 20 yard radius. One thing I’ve noticed about the churches on the island, they aren’t shy about reinforcing their old church yard walls with cement. One such wall was nothing but a blank face of cement while the side facing the street was studded with the big old stones. Oh, and hedges. They really love their graveyard hedges. Hedges to separate the rows of graves. Even mini-hedges barely higher than one’s ankles to separate the plots. Makes searching for runestones a bit challenging as there’s almost no clear view across the churchyards. Klemensker Church was open as well and much as the same as Rø Church inside. White, stark and functional. Right down to the organ. The pulpit was a bit more ornate. More decoration, mostly inset panels with paintings of either the Saints or Apostles with gold accents. A little ‘roof’ was suspended above it with a little more decorative wood work. It was here that I took a photo of the ship model hanging from the ceiling. There was one in Rø Church as well and still another in a church a little further on. It seems most of the churches on the island have ship models. Not surprising I suppose given that it is an island. Still, since Denmark is mostly a nation of islands, I wonder if there were ships in some of the Danish churches I photographed last year. I didn’t look in any of them. I wonder if they were as frequently unlocked as the ones on the island. It was with trepidation that I went back to the trike to set off down the road with no more rail-trail in the immediate area. The torment of the previous ride still haunted me. Turned out, I needn’t have worried. From Klemensker, it was mostly down hill and on a dedicated cycle path separated from the main road by about 10 feet of grassy median. Loke ticked on like a well-tuned machine allowing us to cruise along at speeds of 8.5 to 9.5 mph. As I kept feathering the brakes to not go streaking along at 20 mph or faster with Loke along side, it crossed my mind I’ll need to adjust my brakes soon to compensate for the wear. A distance sign for Rønne, the island’s largest town, stood at an intersection but it was the name under it that caught my attention. Nyker. I stopped to pull out my map key and grinned. ‘Nyker Round Church’ printed boldly next to a number. I think I actually giggled as I loosed the brake. The laughter spurred Loke into an attempt at a run. Silly dog. Soon the distinctive round, almost tee-pee like roof of Nyker Church made its appearance through the trees. The two way cycle path split as we came into the village, each direction on its respective side of the street. After startled looks at a recumbent trike with a panting husky along side, a few people waved in greeting. A bit closer to the village center, I passed what was clearly a sort of field day outing. Dozens of teens, probably the equivalent of American 10th graders, on bikes with two adults in their midst. It was a sudden parade of waves, smiles and calls of, “Nice bike!” or “Beautiful dog!” and the like. My arm was tired by the time the last one passed. I have to say though, I would have loved nothing more than to go on class outings like that when I was in school. A definite pang of envy. I had to scurry across the street to park in the grass at Nyker Church. Loke sighed as I rolled to a stop. I think he understands that he’s not coming with me when I stop for something on Bornholm. I loved the church. White plaster walls following a smooth curve. There were a few angular additions, but the heart was beautifully round. I always seem to come in on the side opposite the entrance which offers chance to see one side of it coming and the other going. The inside caught my breath. For furnishings, it wasn’t much. What looked like present day bricks for flooring. Modern chairs of cane and wicker set in circles facing inward rather than pews. What struck me most though was the smooth lines of the walls flowing into the ceiling, the center of which was supported by a huge column over 3 feet in diameter. It dominated that small interior. A bit of mural work decorated the column’s top where it flared to seamlessly join the ceiling. There were other murals here and there on the walls, but they seemed a little off to me. A bare step up from a school kid’s drawings. Proportions just a little too off here, faces a bit too cartoony there. Yes, even compared to the simplistic, two-dimensional figures of medieval art work. Very pretty all the same. In the square porch attached to one side of the central round of the church, I found a runestone kinda hung on the wall. It’s either DR-#389 or DR EM85;432F. It’s hard for me to tell because the style of the rune ‘ribbon’ as well asthe runes themselves look kinda thick and clunk. So, I can’t tell if it’s the coherent viking age stone or the medieval jibberish one. 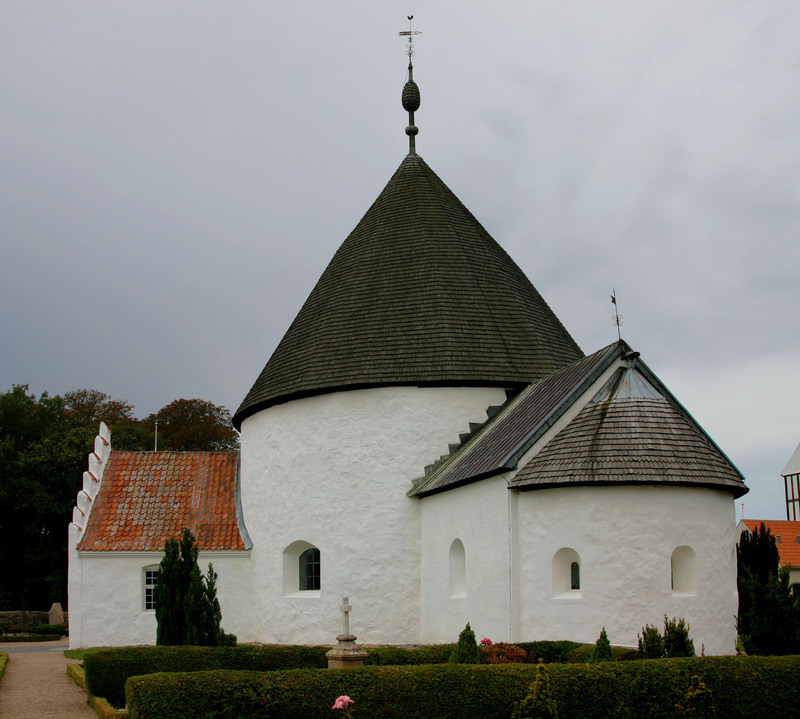 I was so thrilled with my first Bornholm round church, I had a bounce in my step. Setting to the task of coiling the Loke’s cable and putting water dish away, I smiled up at a woman as she stopped beside us. We had a bit of a chat. Once she understood I didn’t speak Danish, but English and, more importantly to her, some Swedish, her speech slowed down. Danish is just close enough to Swedish that with effort, depending on the speaker’s accent and how fast they’re talking, I stand a chance of puzzling out what they’re saying. Most have been able to understand when I’ve replied in Swedish if they’ve not had any English. She was mostly interested in Loke, which is most common. She asked if he was some kind of sled dog. How far had we gone? How far would we go? How old was he? It was a slightly odd conversation being in Danish and Swedish. I took a moment to ponder at a distance sign just at the roadside near the church. Aakirkaby (Aa Church Village). It was about 12 km away, so a bit more than 7 miles. There was a mark on my map for it, but I couldn’t decide if I should aim for it. I scanned maps and decided on Rønne with a few more stops in between. Oh! In the midst of my miles by the wide open fields, I discovered what all those rooks were doing. They were hunting snails. The clever birds were doing what I’ve seen videos of other corvids do. Using cars to help them crack difficult food. They’d pluck up a snail and drop it on a hard surface to crack the shell. If it didn’t break, they’d next drop it on the road for a car to smash so they could dart down and pluck up the meat. I got to experience this first had when I turned onto a smaller road called Ellenbyvej (Ellen Village Road). Lacking a dependable stream of traffic a couple of the rooks decided to give me a try. A snail plonked onto the road in front of me. I’m not fond of rooks, but had a moment of kindness and helped the bird. I generally avoid running over snails, but since there was something’s lunch I made an exception. Seeing that, another bird dropped a snail. A third one must have been a young bird, because instead of dropping his potential dinner a few yards in front of me, it fell on me. Right through the vents in my helmet actually. Laughing, I stopped to take the helmet off and pull the lucky little cephalopod out of hair. That seemed to change the birds’ minds about my suitability to crack their snails. There was no cycle path or lane on that road, but the few cars that came along were polite, giving plenty of space as they passed. It was only for a mile and a half. There were a few hills here and there for me to climb too, but their grades were generally 5-6% or so. I even with legs feeling rather worn from September 29th’s ride, I spun up with no real distress, often faster than 4 mph which is pretty good for me on that grade. Admittedly, Loke was pulling like a freight engine making things easier. Minutes after turning onto a busier road, with a cycle lane on the shoulder, I saw the tower of another church. A quick glance at a map identified it as Saint Knuds. Inside St. Knud’s. Fanciest pulpit on the island so far. The cycle ‘lane’ was pretty narrow, hardly wide enough for my trike. Loke spent a bit of time leaping through the road weeds. People were still very nice about giving space. Quite a few waves and smiles actually. Swedes are friendly, but not the very open in-your-face kind of friendly. They’re often reserved, but I get plenty of waves and people asking about Loke when I ride in my adopted home land. That reservation has never really bothered me as I tend to be a bit of a loner. I’ve heard some immigrants from particularly gregarious cultures remark that Swedes are stand-offish and aloof. I’ve never seen that, but I guess it all comes down to what you’re used to. The Danish people are a little more open. Not to the point of people in the American southern states, but I’ve gotten more greetings per people passed than Sweden. Saint Knud’s Church was much of a kind with the previous two. Not a soul within, but unlocked. White painted interior with little ornamentation and a box for a pipe organ. The surprise came when I went to leave the church, looping around the back rather than going out the way I’d come in. Noises rumbled from the opposite wide of a mounded ridge of dirt just high enough I couldn’t see over. I came up to a little path cresting the pile. Loke watched after me as up I went. Good I’m not afraid of heights. After a few yards of flat ground on the other side of the dirt, the mouth of a massive pit yawned. The edge plunged for tens of yards to a pool of blue green water below. On the opposite lip of the hole was some kind of processing buildings at the head of a switch back track. The strip mine was still being worked. What they get out of it, I have no clue, but the scope of it, so close to Rønne and Saint Knuds Church surprised me. The path was navigable. It ran right along a chain-link fence to keep the public out of the mine area. Roots of the trees buckled the asphalt so I only went along at about 3 mph. I didn’t want to lose any teeth by slamming the trike over them. It emerged in the parking lot of a sort of housing complex. A half-dozen or more people stood around, socializing and smoking. All of them turned to smile and stare as we moved by. They started waving and calling out about the beautiful dog and the cool trike. About the time we rejoined the main road heading into Rønne, the rain came in earnest. Water hit my head through the vents in the helmet, running its annoying way down my scalp. Loke jogged along, downhill, with his head down and ears flat to keep the rain out, squinting all the while. It wasn’t nearly as cold as I expected. I wasn’t wearing an extra layer and though I wasn’t exactly warm, I wasn’t blue and chattering either. At the bottom of the hill, just before entering Rønne proper, I found a random rest stop. I guess it must have been for cyclists as I can’t see why it would be there for cars a stone throw from town. It was still almost dry at some of the picnic tables under the trees. I stopped to water Loke while I darted into the restroom there. Then I started looking at maps again, trying to figure out where to go. Settling on east by trails and paths kinda following the island’s southern coast, we set off. Getting through Rønne was a bit annoying. More barriers across the cycle paths with barely enough room for standard bikes to be walked by/through them. One, Loke had to be unhitched while I pushed the trike up an embankment to go around. Seriously! I can understand them not wanting cars on the trails, but to make it nearly impossible for even bicycles to get through without having to be manhandled up an overpass embankment is downright silly. I was fine not stopping in Rønne. The only POI I’d found in the town, Bornholm’s largest was potentially the church, which was encased in scaffolding. What little driving we’d done through there didn’t make me go ‘Oooh! Must go here to photograph that old street!’ It left me overall unimpressed even before the barrier issue. Skirting the place and getting back to calmer areas seemed most sensible. I tried to stay on cycle paths, which required a bit of zig-zagging. Soon Loke and I were whirring through a corridor of trees on a paved cycle path. It followed with the east bound busy road, occasionally joining it as a combination cycle path/pedestrian walk, but for enough of the time, it was off on its own through the wooded patch. Too soon the pretty part was gone as the cycle path joined the side of the road. As it came up toward 5 pm, the Garmin ticked past 19 miles. I still felt good and strong. Loke was still moving like an unstoppable machine combined with a sulky horse, pulling the trike along at nearly 9 mph. But I was hungry. Actually beyond hungry. Breakfast had been a few graham crackers with peanut butter at 6 am to keep my tummy mostly empty for me to feel my best on the ride. Nearly 12 hours with nothing but small, frequent sips of water! Oh! Nearly forgot the two small apples I pulled off a tree along the rail-trail! I kept rolling while talking with Jens to arrange a pick up. Arnager was a tiny village at the end of the airport. So, I told Jens to aim for there. There was one of the cultural signs just off the Southern Land Road, but it looked like I’d have to wade through waist high weeds. Instead I pushed on toward the village in search of the cafe that had been indicated by another sign. The village felt oddly deserted though and what few people I saw gave me somewhat sour looks. I started feeling a bit like an intruder. I turned us back around to go sit on the tiny parking bay by the cultural sign. Jens had said he’d be about 25 minutes. We had roughly 20 left, so I gathered up the stuff I absolutely will not leave on the trike and set us off toward the burial mound marked on my maps. It turns out the path was somewhat recently mowed, two weeks or so. Enough I didn’t feel like I was going to come out with a dozen ticks and Loke a few hundred. Well, being ruined makes photographing the interior easier. The old passage grave was much smaller than I expected and quite ruined. Most of the capstones atop the passage and the chamber were completely gone. When I walked up on the sides to look down, Loke’s curiosity took him into what remained of the chamber. He sniffed around, probably hoping for some small creature to eat. The passage grave actually sat in a field of corn. The stunted looking stalks all around. Before we left the grave, I walked over for a closer look, to see if there were any actual ears of corn. I abruptly shied away from what looked like a huge paper wasps’ nest. It was nearly as big as my head. Curiosity pulled me back to look again only to recoil once more. It wasn’t a wasps nest. Something was horribly wrong with an ear of corn. It had split apart, swelling into these white tubelike shapes. I looked around and saw more of the small ears (the healthy(ish) looking ones barely 10 inches long with husk and tassel) that showed the same deformation though not nearly as full blown as the first. It repulsed me. I actually shivered as we started back to the trike. I kept Loke tight beside me right in the center of the path. We left the corn and I let Loke have more leash. About halfway back, I spotted Jens standing at the road edge. He’d made much better time that he had said. Once we got loaded up, we rushed off in search of food. It felt soooooo good to get a full belly!